When I began my most recent book, The Outcast Dove (Forge, 2003), I had a clear idea of the focus, I thought. After eight mysteries featuring Catherine LeVendeur, a Christian, I would finally be able to explore medieval Jewish life from the inside, by making Catherine’s cousin, Solomon, the main character. I spent a lot of time researching the customs and daily life of Jews in the Occitan, where the book takes place, including two months in Toulouse, a wonderful town near the slopes of the Pyrenees. In the course of the research, I had two surprises. The first is that no one is sure what the customs were in Toulouse in the 12th century. They seem to have been a blend of northern, Ashkenazi ritual and Sephardic ones from Spain. The second was that, especially in Toulouse, Jews were very much integrated into the life of the town. They did not live just close to the synagogue, but in all the quarters of Toulouse. They also participated in town government and owned property and businesses with Christians. This doesn’t mean life was perfect. It could never be as long as Jews were considered infidels and a threat to the unity of Christendom. However, in the everyday life of Toulouse, tolerance was the norm. Finding this out was actually liberating for me. I couldn’t write about the usual prejudice and persecution. I needed to look inside both groups and see the problems of the characters as unique. For instance, Aaron is a horse trader, but he’s also a Cohen, a member of the priestly caste that had had no real function since the fall of the Temple eleven hundred years before. As such, he’s still bound by special laws of purity and standards of behavior that often interfere with his own desires. Then there is Belide, a bright young Jewish woman whose friendship with the Christian boy, Arnald, is viewed with alarm by both their families. Which is stronger, her faith or her feelings? Throughout history love has often proved more powerful than religion, country or family. Does Belide care enough for Arnald to be cast out by her family and by God? And who could be more of an outcast than Babylonia, the Christian servant who despises Jews and yet works for one? What has caused her deep hatred? I began to realize that there are many outcast doves, beating their wings against the storm, hunting for refuge or trying to find their way home. There are two different forces working in The Outcast Dove. One is religion, a way of defining oneself and being part of a group; the other, more slippery, is faith. For the sake of his faith, Solomon’s father, Jacob, has made himself an outcast, abandoning his family and his culture to become the monk, Brother James. He finds himself trapped by his decision, loathed by his son and distrusted by his fellow monks. For James the trappings of religion see him through the day and night, but it’s his firm belief in Christianity that allows him to survive. Aaron believes in his religion but he’s willing to bend the rules to get what he wants. He cares more about himself and the opinion of others than he does about offending God. Or does he? And what does Solomon believe? He insists that he’ll always be a Jew, but he spends most of his time with Christians. He ignores the dietary laws and can barely remember the ritual prayers. He finds the concerns of the scholars incomprehensible. And yet, he longs to discover a meaning to his life, something that makes him believe. Throughout this book, I found myself exploring the internal and external ways people view religion. For many Jews, the laws and customs were what made them able to hold to a faith that sometimes seemed outmoded. The ceremonies and holidays reminded them of their covenant with God. But there were also the Jewish mystics, who sought to reach up and meet God halfway. This was the time of the beginnings of the Kabala. It was also a time when Christian mystics were searching texts and their own hearts to make a stronger connection with their faith. And yet most people seem to have spent their lives muddling along, coping with life as it came to them and not thinking much about what they believed until they needed to, in times of crisis, childbirth, illness and death. At the end of the book, Solomon still isn’t certain of his own beliefs. But he has had the opportunity to see the best and worst in the faith of others. What he’ll decide, I don’t know. As with all of us, his life will be the search. 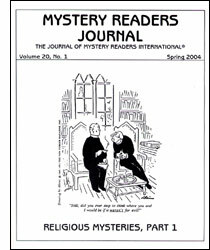 You may ask if this book is a mystery or a tract. Never fear! There are bodies galore; a monk, a Jewish scholar, even a knight. Did they die for faith or something much more secular? Read The Outcast Dove and see. Highly popular in the US, Newman’s Catherine LeVendeur mysteries are also published in translation in Germany, Portugal, Czech Republic and France. With Miriam Grace Monfredo, she edits the Crime through Time series of historical mystery short stories. She is also the author of a trilogy of novels based on the life of Queen Guinevere. On the Road to Damascus, or, Me, a Christian Writer? Holy cow. I had a vision of my mysteries selling in the “Christian” rack at the supermarket, alongside chaste frontier romances and child-rearing advice from Proverbs. Then I remembered that my second book, A Fountain Filled With Blood, came out (no pun intended) in favor of gay marriage. I realized that had scotched my entrée into the lucrative world of Christian lit with that, and I breathed easier. Because it’s just not very, well, Episcopalian. But the questions lingered for me. Was I evangelizing? Was I subconsciously hoping someone would read Out of the Deep I Cry, close the last page, and come down the aisle to Jesus? I didn’t think so. After all, according to my dictionary, to evangelize means 1. to preach the gospel. 2. to convert to Christianity. (The 1950 American College Dictionary, in case you’re wondering. A sentimental favorite.) My mysteries feature a brand-new Episcopal priest, Clare Fergusson, who spends a good deal more time struggling with the politics and personalities of her conservative parish than she does preaching. Nor does she spackle over the many cracks and flaws in her conduct with an assurance of absolution and salvation. (Years ago, I drove past a church whose sign board read, “Christians aren’t perfect—just forgiven.” While true in the theological sense, it struck me, then and now, as smug.) The Reverend Clare Fergusson drives too fast, drinks and swears, and has fallen hopelessly in love with the town’s “very married” chief of police, Russ Van Alstyne. She makes a poor advertisement for the idea that faith relieves you of your confusion and self-doubt. But she does exemplify one of the central tenets of her faith: she is always trying to reach out and help others. Of course, her passion for social justice and her ability to care for distinctly unlovable characters is invaluable, considering she’s always discovering murders and missing people. If she stuck strictly to saving souls my books would be about 50 pages long. It’s not simple expediency, though, that has made her so compassionate. For me, the ability to—as one theologian put it—see the Christ in others is the most vital and difficult part of my faith. I tend to be selfish, snarky, and far more likely to donate to a fund rather than actually roll up my sleeves and work with the poor and dispossessed. While I’m writing her, Clare gives me a chance to be someone for whom altruism comes as naturally as breathing. At the same time, I get to redeem selflessness from the aura of saintliness that surrounds it. I think we all assume people who give and give and give to others are better than the rest of us, nicer, sweeter. Clare isn’t. She doesn’t necessarily like those she’s helping out. She snaps, she rolls her eyes, she thinks distinctly uncharitable thoughts. And then she goes ahead and knocks herself out on someone’s behalf. I like the idea that readers can see that caritas, the virtue translated as “love,” is messy and imperfect and achievable. Oh, my gosh, I am evangelizing! I decided I had better check to see if I was writing Christian mysteries. Since my American College Dictionary has no definition, I went to the submission guidelines for two of the largest Christian houses today, Multnomah Publishers and Tyndale House Publishers. Multnomah says “faith and godly relationships should be woven into the fabric of the tale.” I have to admit, when I first came up with Clare as a character, it was because I wanted to tackle mysteries with someone whose primary motivation wasn’t nailing the bad guy or clearing her name, but who was driven by her faith to pursue justice and healing. As for godly relationships, I have my doubts that the growing, simmering, ready-to-erupt-at-any-moment attraction between the priest and the cop qualifies. On the other hand, they haven’t done anything yet because of their… well… moral convictions. Tyndale House looks for characters “who struggle and grow in their understanding and knowledge of God.” Here, clearly, I miss the Christian fiction mark, since Russ Van Alstyne remains quite comfortably in his agnosticism and I’ve yet to write a single conversion scene in any of my books. Of course, Clare increasingly kicks against the strictures of her role as a priest. Is she any sort of example to her hide-bound parish? Can she wrest control away from “the dinosaurs”—the old white guys that control the church’s governing board? Is she making any difference in people’s lives in the tiny Adirondack town of Millers Kill? I’m never going to make it in Tart Noir. Julia Spencer-Fleming, author of the Macavity, Agatha, Anthony, Barry and Dilys Award-winning Millers Kill books, lives outside Portland, Maine. Where it is Spring. Almost. Her latest, Out of the Deep I Cry, is available in April from St. Martin’s. Visit her at juliaspencerfleming.com.